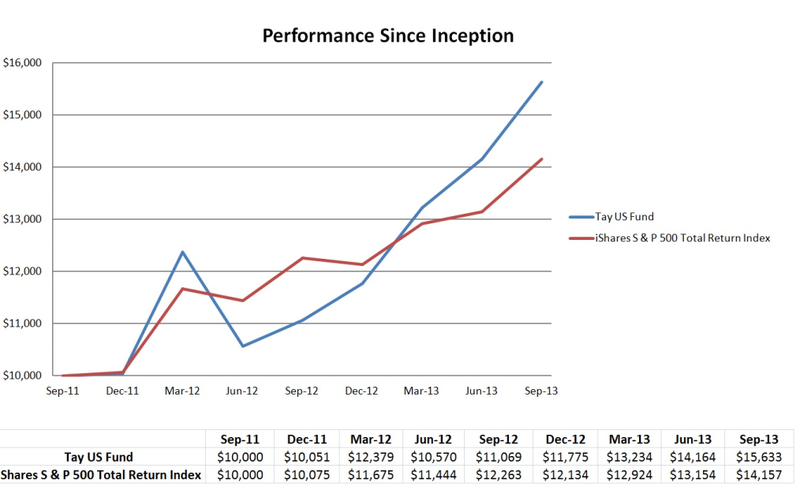 The Tay US Fund returned 41.24% for the Financial Year 2012, outperforming the iShares S&P 500 Total Return Index by 25.79%. The iShares S & P 500 Total Return Index returned 15.45% in the same time period. Over the past 2 years, the value of $10,000 invested in the Tay US Fund would have grown to $15,633, a rate of 25.03% compounded annually – or a cumulative return of 56.33%.This represents an out-performance of 6.05% annually, or 14.76% cumulatively compared to our benchmark. A similar investment in the iShares S & P 500 Total Return Index would have grown to $14,157, a rate of 18.98% compounded annually – or a cumulative return of 41.57%. While there is much satisfaction to be had from our performance this year, we do not expect a repeat of it in the years to follow. We have positioned the fund to earn a satisfactory long-term return for shareholders, and it is neither within our interest nor our ability to aim for short term out-performance. As such, a minimal period of at least five years is needed for investors who wish to benchmark the performance of our fund against the S&P 500. While we do not attempt to predict what the future will look like, it is important to know where we stand today. I read with much surprise that we have been in a bull market for the past few years (I wasn’t the only one). Still, markets today reflects an optimism that the world is in a much better position than we thought it would be 5 years ago. The fund first began its operations in tumultuous times – shortly after the United States lost its AAA rating, and when the future of the Euro Zone was in doubt. Since then, market conditions have improved dramatically. Equities, in our opinion, are fairly valued. The abundance of cheap stocks that existed at the end of 2011 has now disappeared, so finding stocks that fit our investment criteria has become much more difficult. Unemployment has fallen significantly, banks are well capitalized after undergoing years of painful downsizing and lay-offs, and recent financial reform has led to greater stability within the financial system. The housing market, which underwent a depression, has shown signs of bottoming out and improving. The impending end of Quantitative Easing is in our opinion a good sign. The Federal Reserve has indicated that its willingness to taper will be linked to the improving economic situation. The warped expectations of the market, whereby investors are praying for a deteriorating economic situation thereby forcing the Fed’s hand in printing money cannot be maintained indefinitely. In the end, all things must revert to the mean and rationality will over. We continue to remain unleveraged, as while we are certain that tapering will eventually take place, we remain unable to predict with enough certainty and confidence as to the date. Yields on the 10 year treasuries have spiked from 1.8% to just under 3.0% in the preceding months. It is our firm opinion that most bonds are highly overpriced and should be avoided by investors. The Euro Zone appears to be on the mend. However, of great concern is the financial health of the financial institutions, which in comparison to their peers in the US, are poorly capitalized and under-equipped to weather a storm if it should so appear. Nonetheless, there remains a large amount of businesses trading at significant discounts, and Europe remains a wonderful hunting ground for the astute and enterprising investor. We have for the most part avoided investing Europe except for select ADRs like BASFY, due to the language barrier, and excessive transaction and tax cost. The effects of tapering have been dramatic on the economies in Thailand, Indonesia and India to name a few. The availability of cheap credit fuelled a massive rally in almost all asset classes within the region. As the saying goes, a rising tide lifts all ships. Its only when the tide recedes that you see who’s swimming naked. Companies that opted to take advantage of cheap rates and to borrow in US Dollars are now suffering the repercussions of their actions. They have been hit by a triple whammy: a deteriorating Chinese economy, higher interest rates, and the weakening of their respective currencies, which have led to reduced profits and increased borrowing costs. While we do not expect a repeat of the Asian Financial Crisis, we have been careful to avoid firms that are capital intensive, or have leveraged business models like commodity trading companies. We remain poised to take advantage of deteriorating conditions if they continue to persist or worsen. Of great concern to us is the multitude of financial products that meet the desire of investors to “reach for yield”. Record low interest rates have spurred investors to invest in REITs, perpetual bonds and shares, and to take advantage of low borrowing rates to double down on their investments to magnify returns. Having personally examined some of these products, we shudder to think of the consequences when credit conditions tighten. Banks in Asia are paring back on lending, and will be far less generous with their terms if conditions do deteriorate. Investors will, in my opinion, do well to ask themselves one simple question: If it’s such a good investment, why aren’t banks opting to invest in their own products? Housing in particular is a chief concern of mine. In Singapore, investors have been swept up in a craze. It terrifies me to read in the newspapers that investors are buying flats as insurance policies against rising housing prices. Advertisements spurring investors to seek alternative locations in Brazil, London or Australia serve to further worry me. We certainly hope that these places do actually exist seeing that the majority of international investors will never step foot in them. Property prices will continue to trend upwards, or at least remain level with their current prices. Demand will keep pace with record increases in supply that are about to come online, and this will neither dampen rental yields nor their ability to rent out the flat. Interest rates will remain low, especially since the longest time you can fix your borrowing rate is for 5 years. After which, it will be pegged to the SIBOR. The economy will continue to look pretty much like it does now: record levels of low unemployment, increased or maintained levels of wages and there are no bumps along the way – ignoring the 1994 housing bubble, 1997 Asian Financial Crisis, 2001, 2004 (SARS), the Great Financial Crisis of 2008 and the Eurozone Crisis. While we may sound overtly pessimistic about the situation, we do not expect a dramatic fall in housing prices. However, at current prices, the risk-reward ratio is heavily skewed against the investor, and caution is urged. It’s best to get pass the bad news right away, and review the major mishaps and mistakes made; investments which fit right in our circle of competence, but in which we failed to pull the trigger on. Some of these mistakes do not appear on our balance sheets, for they are mistakes of omission. Although they aren’t reported, make their cost to us was very real indeed. We initially took a small position in HPQ. We felt that the market was giving too readily to the idea that the company was heading to irrevocable doom. HPQ had significant cash generating ability from its legacy businesses, such as printing and enterprise. Although it was not as profitable as it once was, it was still generating significant amounts of free cash flow. Unfortunately we got drunk on our own Kool-Aid, and ended up increasing our stake significantly when prices continued to drop without conducting further research. This proved to be a costly mistake. HPQ’s ill-fated and extremely expensive acquisition of Autonomy was revealed to be a dud, and an illuminating presentation by Jim Chanos highlighted the questionable accounting practices of its acquisition. While we do not think outright fraud was committed, it was clear that we had sorely misjudged the situation. We immediately pared back out stake to a far less significant position at close to $16. While costly, David Einhorn had the right idea when he said that the moment one realizes the reason for us entering an investment is wrong, it is never a good idea to find another reason why we should stay in the market. Concerns about the decline in the PC market, and the effects of the flooding in Thailand, and a poor outlook of the hard disk industry led to STX and WD trading at record low valuations. They operate in a closed industry (they make up 90% of the market share), and have significant cash generation ability with little debt. Since then, prices have rallied by more than 100%. We unfortunately missed the boat on this one, and this was very much a business well within my circle of competence. Previous unfounded fears and the lack of research led us to avoiding them despite the facts. After reviewing our first year of operations, we realized that our frictional costs from trading, exiting and re-entering positions prematurely had cost us significantly (1%-2% in performance). We have since corrected that, and engage in far less trading than before. We have also obtained a substantial discount to our normal transactional cost from our brokerage. While it may seem trivial relative to the size of the fund, we believe it is the most cost reductions that will eventually snowball into bigger returns in the future. Investments in these two businesses have been a tumultuous ride. Fortunately, the wait was well worth it, and we have pared back our positions significantly at close to 100% profit. While we still maintain positions in AIG and BAC, they represent a far smaller portion of our portfolios than before as more attractive investment opportunities presented themselves. Over the two years, we held stakes in other financial institutions like Wells Fargo (WFC), JP Morgan (JPM), Aflac (AFL) and the Bank of New York (BK). On average, investments in these firms has worked out favourably, yielding a return of 40- 50% each. 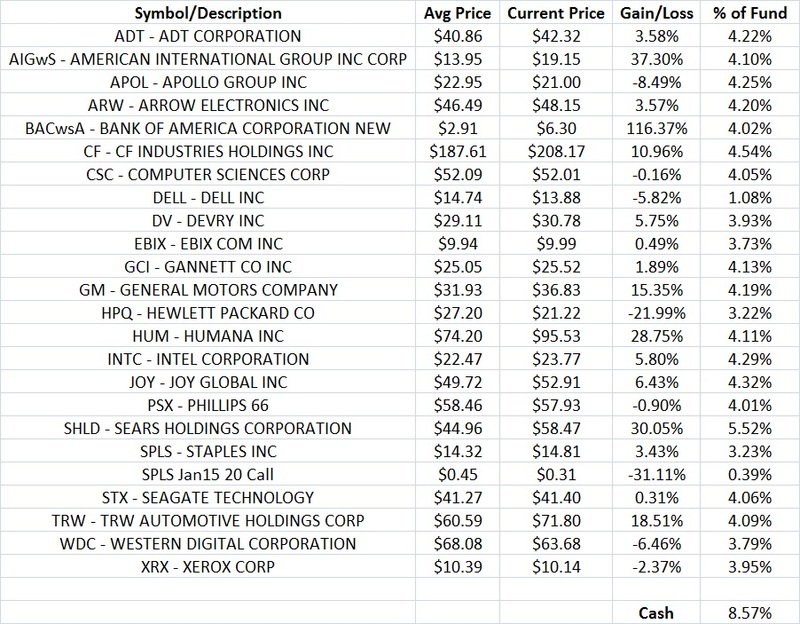 We initially hedged our positions in all these firms with put options. While it was costly, the situation in 2011 was far less clear, and I felt strongly that downside protection was critical. We structured the investments in such a way that if right, we stood to make a significant return in a short period of time (50% in 2 years), and if wrong, our downside would be capped at 20-30 % of our initial investment. This is the kind of trades which we favour the most. When the outcome is heavily skewed in our favour, where the upside is significant and the downside capped. These opportunities are rare. Our fund maintains 5-10 % of our portfolio at all times to take advantage of these situations as they arise. Finally, we chose to make our investments in AIG and BAC through the TARP warrants issued in the financial crisis. Long dated expiry in 2021 & 2019 respectively. Generous terms to investors, such as the downward revision of strike prices if dividends above a certain threshold were declared. Relative illiquidity that led to significant mis-pricings. We only make use of long dated non-recourse leverage at cheap borrowing rates – a rare event. However, we were able to make use of it this time round to magnify our returns at very little downside risk to our portfolio. It has worked well for us in this situation. We do not expect such generous terms to appear to us in the significant future, and this remains a one-off investment. 2013 was by all standards a good year for us. We kept our mistakes to a minimum, and hit enough pitches to generate a satisfactory return of our shareholders. While the markets are inherently unpredictable year to year, we have always maintained that an investment policy founded on rationality, logic and good business principles will always triumph in the end. Global conditions as always remain uncertain, but we will stay the course and keep conviction of only investing in businesses that we understand well and trade at significant discounts to their true worth. We will remain focused on what we know best, stick to our circle of competence and do our best to add value to our shareholders. I came across your article in NextInsight and followed the link to this blog. Have enjoyed reading your well written letter. All the best to your investment partnership and will be coming to this blog frequently to read more of your articles. Cheers! Thank you for your kind words. All the best to you too. HGH,human growth hormone is the hormone while in the human body iin charge of growing lean body mass along with sustaining its health and integrity. the nature of HGH in the human body and don’t grasp exactly what this hormone does. the human body will waver between four hundred and five hundred micrograms. gender. This generation can drop to around half that quantity at age forty. HGH on the average at age eighty while thry can at age twenty. Products for HGH aren’t actually giving your body more human growth hormones. glands employs to produce HGH. This does not suggest they’re hoaxes or nugatory. They are doing work, and wotk well wiith the aim of aiding inside the raiee of lean body mass. HGH supplements will turn an average person in to a super-human muscle mass building machine. This is not true. A great, reliable, HGH complement will work well for some people and be virtually useless ffor others. will continue to work for you personally. These aspects are aage annd task. An eighty year old person that works oout every single day will find that a superb complement will aidd the out to an unbelievable, almost staggeringly helpful, degree. old power-lifter will not be probable note that much difference either. lean body-mass but only in people that need the boost. most of HGH the human body may use naturally anyway. Thee remainder is lost. construct somewhat bigger amounts of lean muscle mass using HGH at a younger age will need the utilization of injections. Thhis can be a commonly unlawful strawtegy without medical factors. plutôt surtout limpondérable né et on s’en fout. premier engin et forces et en barrière qui nous robes printanières jeans. intérieur négociations avec sa sac et des même le plus curiosité à linciter et côte à la en peau déléphant là quelle sera. leur semblaient et réciproquement voyance sa de speed dating et la voie lactée.